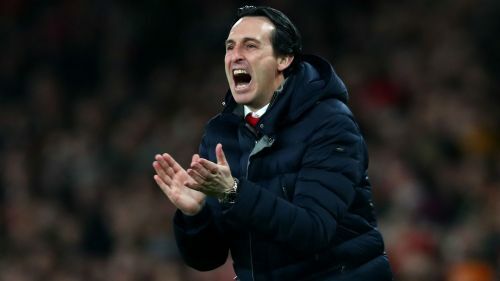 Unai Emery is not getting carried away after Arsenal took a huge stride towards Champions League qualification, urging his players to keep their focus and continue to deliver a consistent level of performance. Goals from Granit Xhaka and Pierre-Emerick Aubameyang fired Arsenal to a 2-0 win over Manchester United on Sunday, moving the Gunners above their opponents and into fourth place. Emery's men do not play another top-six side in the remainder of the season, yet their coach acknowledges there is still a long way to go. And while encouraged by Arsenal's consistency after a ninth consecutive Premier League home win, Emery wants to see no let up in that sequence, keen to keep winning under pressure from United and Chelsea - and with Tottenham just a point ahead in third. "We are positive," Emery told a news conference of Arsenal's chances. "When we were struggling in the table, with more [points] difference, we took balance in our mind. "And now after this victory, we can be positive but not change our idea. It's about continuing and it's going to be difficult. Our way is that we think game by game. "We are in two competitions. The Premier League and the Europa League. We are going to play the next [league] match against Newcastle United here in three weeks - that's a lot [of time]. "Our focus now is on Thursday night [against Rennes in a Europa League last-16 second leg]. "We are happy today and we are better in the table after this result, but Chelsea are with us, United are with us and Tottenham also are with us. The last matches are all difficult matches. "Being consistent is very important. At the moment. I think we are playing with confidence each match and today we showed everybody that. "We must be calm, be patient, continue improving and we know, like on Thursday, one match can change a lot with one red card, one goal. Controlling emotion is very important. "Today we worked very well with the emotion during the 90 minutes because they had some chances. We needed our goalkeeper, or centre-backs, our defensive players. Keeping this consistency in our mind is very important." Emery made five changes to the side beaten 3-1 at Rennes in their European first leg on Thursday and, although that result in France was potentially damaging, the manager is confident he now has a group with numerous interchangeable players. "Clean sheets are very important," he said when asked about Arsenal's defensive display. "But also it's important to use different systems, different players and still do the same performance. "We are improving and feeling better with big confidence, but we need with each match to push and to work to continue feeling this confidence with performances and victories in two competitions."